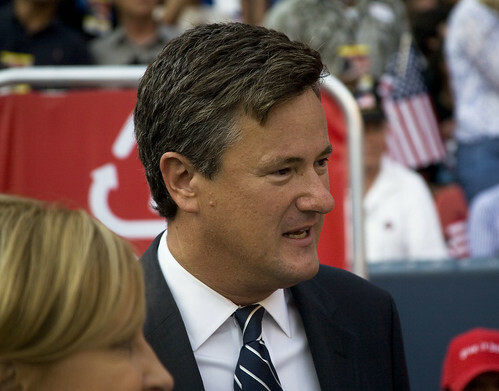 Joe Scarborough of MSNBC seen walking around the convention floor. © Alison Klein, WEBN News 2008. I still have not recovered from the time change. This morning I awoke at 4:45 AM to a program I have not seen in quite some time, MSNBC’s Morning Joe. Too bad I couldn’t fall back to sleep. During a discussion about yesterday’s Bush interview with Matt Lauer when Bush stated in no uncertain terms that he authorized torture and it was “legal because the lawyers said it was legal” Joe Scarborough went on a screaming rant claiming that “the left” finds it “more objectionable to kill little four year old girls and grandma’s than to pour water on someone’s face or keep them up all night.” He goes on to ask with indignation how this could make sense badgering Mika Brzezinski who didn’t seem to have a response. I am not aware of anyone on the left who would say that killing innocent civilians in collateral damage – which is what we are talking about here and is nothing new to warfare – is somehow less morally reprehensible than torturing someone. They are both equally bad and the fact that Joe doesn’t get this is what really bothers me. The left has been complaining about the immorality of war exactly because of this type of indiscriminate civilian killing going back to Vietnam (and I am sure earlier) only back then when the left made the complaint that Joe made today we were derided as being communist America haters by none other than people like Joe. Spare me the post-partisan stop-the-hyperbole-shtick Joe if all you are going to do is use it as cover to make outrageous claims like this. Yes there has been an unprecedented increase in unmanned drone attacks in recent years but it is not because of some screwed up liberal moral compass but rather because these are mainly attacks in areas inside Pakistan where we have no other options. Is the killing of innocents in war wrong. Yes. Did you ever give a damn about it in the past. No. I have a suggestion Joe, pick a line of reasoning and stick with it. It does no good to take people to task who play with their poop. I agree. He seems to have become hyper in the last week or so. Perhaps he should be restricted to d-caf, and leave the regular coffee to others. Isn’t Joe Scarbrough the congressman who [REDACTED BY MT DUE TO UNSUBSTANTIATED LIBELOUS NATURE] I think the coroner and police covered it up. I can’t remember. Good point. Plus, the claims about torture made by the Bush administration and their allies have not held up to scrutiny, including those about KSM. The British have refuted the Heathrow one. There are plenty of books, docs and blog posts dissecting, fact-checking and rebutting other claims. Even if you put aside the strong moral and legal arguments against Bush and Scarborough’s claims, their assertions hinge on the notion that torture “works” reliably for accurate intel. History shows that isn’t true, and according to the British, FBI interrogator Ali Soufan and the CIA’s own internal docs (two memos written after the fact, probably at Cheney’s insistence) it wasn’t true for KSM and Abu Zubaydah. By the way, how long a fuse is there on that ticking time bomb if you’ve got time to waterboard two prisoners a total of 266 in a single month? I am opposed to immigration “reform” (amnesty). This country is overpopulated, and 21 million Americans are out of work.